Two months to the day before news broke that Cuba and the United States would normalize diplomatic relations, the Archdiocese of Baltimore played host to a visiting prelate from the Caribbean island nation. That exchange was followed by a grant of an unspecified amount from Baltimore to a feeding program in the Diocese of Pinar del Rio, resuming a connection that dates back at least to 1997. In simultaneous news conferences Dec. 17, President Barack Obama in Washington, D.C., and Cuban President Raul Castro in Havana announced that the two countries would re-establish official diplomatic relations. By then, some in the archdiocese were already familiar with one face of the Catholic Church in Cuba, as Bishop Jorge Enrique Serpa Perez had visited several Catholic Charities of Baltimore agencies Sept. 17. The visit originated in the archdiocesan Office of the Propagation of the Faith, which is directed by Deacon Rodrigue Mortel. 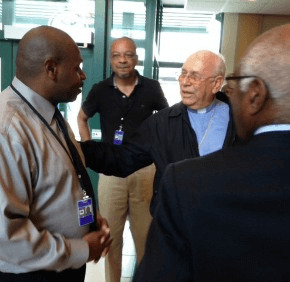 His office directs the Baltimore Haiti Project, where nearly two dozen parishes in the archdiocese send monetary aid and personnel support to sister parishes in the Diocese of Gonaives. A native of Haiti, the most impoverished nation in the Western Hemisphere, Deacon Mortel first visited Cuba in 2012. Deacon Mortel said that Baltimore-based Catholic Relief Services (CRS) pointed him in the direction of Caritas Cuba, the national coordinating agency for Catholic charities and social services. It is headed by Bishop Perez. Bishop Perez described nascent feeding centers to Deacon Mortel. Beyond that grant from the Office of the Propagation of the Faith, the size of which he declined to specify, Deacon Mortel discussed the long-range goal of formalizing a relationship between the Archdiocese of Baltimore and the Diocese of Pinar del Rio, the westernmost diocese in Cuba. It is not the first time the two dioceses have been linked. Cardinal William H. Keeler, archbishop emeritus of Baltimore and Deacon Mortel’s initial sponsor here, celebrated New Year’s Eve Mass in 1997 in Pinar del Rio, where the then-bishop was an old friend who had visited Baltimore. Cardinal Keeler was in Cuba with CRS, a few weeks prior to St. John Paul II’s historic January 1998 visit to the Communist nation, which was once officially atheist. According to multiple news outlets, Pope Francis made personal appeals in 2014 to Obama and Raul Castro, encouraging both to normalize diplomatic relations between the two countries. Since 1960, the U.S. has imposed an economic embargo on Cuba. Vatican secretary of state expects pope to visit New York, D.C.